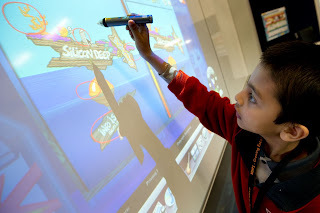 to support the development of a new online resource, the Hector’s World “Tech Cave”, which provides tools for kids to teach themselves and their communities about how technology works. We announced the new resources last week at Mission Heights School in Auckland, and got lots of great feedback from the kids and grandparents present. Hector’s World is a free online teaching and learning resource created in New Zealand and used in many New Zealand primary schools and early childhood centres to teach ‘digital citizenship’ – the smart, safe and responsible use of technology. It offers knowledge and skills in a fun, interactive environment in order to help children become confident and respectful digital citizens, encouraging them to think critically and make wise choices as they make their way in the online world. The launch of the Tech Cave will help to ensure even more Kiwi kids are well positioned to take advantage of the benefits of the internet in a smart, safe and responsible way. We’re pleased to have joined together with Hector’s World™ to support the development of a new online resource, the Hector’s World “Tech Cave”, which provides tools for kids to teach themselves and their communities about how technology works. We announced the new resources last week at Mission Heights School in Auckland, and got lots of great feedback from the kids and grandparents present.